So many new things this week. I made scones, the lemonade recipe variety. They took 3 times as long to cook than they should have, I think my oven wasn't hot enough and my dough was too wet. It was virtually gloopy. Still, we ate them! I made sausage rolls for the first time. They were 'cheat' sausage rolls, only requiring puff pastry, sausages with skins removed and an egg to wash the top. This was the only photo I managed to get, and you have to thank my helper for this one. My hands were full of pork. This makes me feel more like we live in the country! Horses! Or probably ponies, I don't know the difference. I don't have an urge to ride the handsome things but the eldest does, so this was a first for him, two horse rides and he is hooked. Loved it. You may have heard about my dumpling obsession. I decided to have a crack at making them after my latest cookbook, Woman's Weekly Superfoods, made it look so damn easy. It is easy, but it is also very time consuming. One for when you aren't in a hurry! It was a simple spinach dumpling (or gai lan, whatever) and I decided to add water chestnuts for a bit of crunch. I was right. Those things were so good. I managed to sneak 6 into the freezer before cooking, and that will be lunch on my next home-alone work day. Heaven. Those shop bought wrappers are the bomb! Lots of lovely dumplings. I decided to cook them in a simple soup with added noodles and veg to make it into a meal. And here is something new, a first for me at least, omelette in the sandwich maker! Is there anything you can't cook in this? Yeah okay, you can't cook most things in here, but you can cook an omelette. I'm not a good omelette cook, and when I decided to make one for breakfast the other day, I no longer even have the pan that's good for omelettes anymore. More spinach. Or silver beet and baby spinach. Whatever, it's a truck load of greens for breakfast, in my effort to get more veg into the people that live in this house. Drizzle of olive oil, waited for spinach to wilt. Added feta and ham. Then 7-8 eggs, beaten with a little milk. It helps that my sandwich maker does this thing, where you can close the lid but you can lock off the height so it doesn't touch the contents, just heats them. It was enough for 4, except littlest turned up his nose so Mr ate his share. It's a cabinet! It's not the one we already had. Mr found this on gumtree, and it was in pretty bad shape. The top had stains, mould in the timber grain, weird stuff dripped down the front it was a mess. He has done an incredible job for his first time renovating a piece of furniture, it looks amazing! It's a Chiswell original too. I grew cuttings! First time! I'm not great with plants, so this was pretty exciting. Took cuttings from my mother in laws plant, put them in water, they grew a mess of roots, then I stuck them in a pot with soil! And they are still going. Snipped some of the vietnamese mint for tonights dinner. 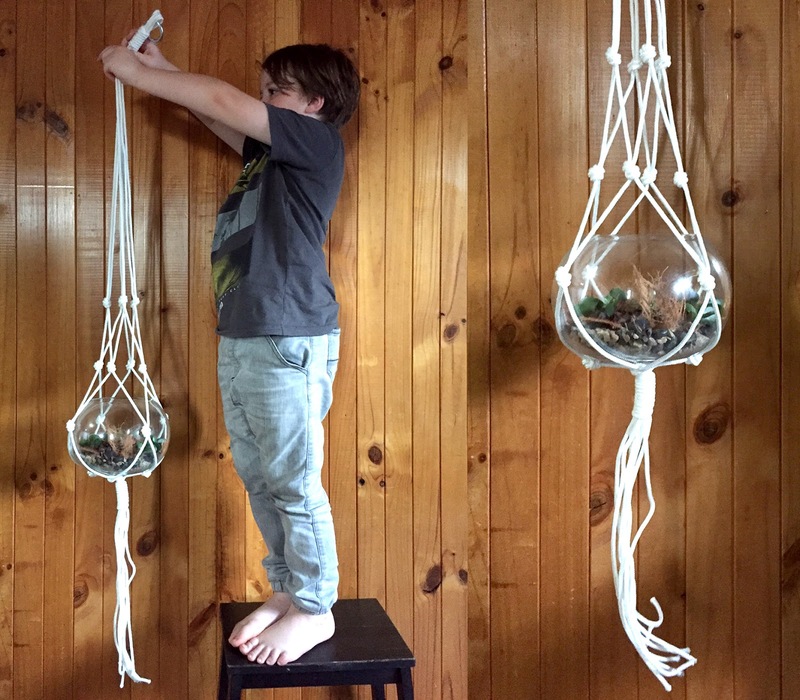 And last but not least, diy macrame plant hanger. It was a very simple design, cobbled together from two sets of instructions, with a final twist all of my own. I used blind cord from Bunnings, which is very plasticy and shiny - not good for the tassle, not ideal but $7.50 for the cord for one very large plant hanger. The macrame cord from Spotlight was about $50 for 4 times the length, so it wasn't too bad a deal. Useful to be able to buy the small amount to be able to test whether or not I was going to be able to do it! I made a nice grey one as well, but I didn't get photos of it and it has already gone to the brother & sister inlaws. As you can see, I don't have a spot for it yet, and it was a bit tricky getting a photo of it as I forgot during the day and it had started getting dark! There it is, a big week of simple lovely little things, all done for the first time. Oh my goodness you have been so busy! And I think you have broken my brain by making an omelette in a sandwich maker...it looked yum. In hindsight probably material for a bunch of blog posts! But it had been playing on my mind all these 'firsts', so I wanted to bunch them all up together and share them all at once. The omelette was a revelation.